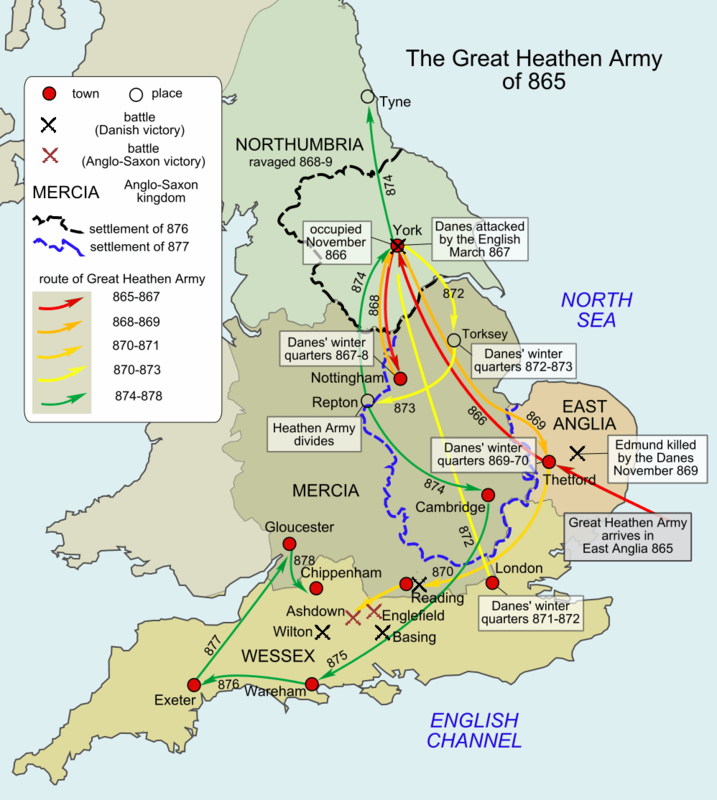 871: The battle for Wessex, or how Alfred the Great came to the throne. Since Ivarr the Boneless and his brothers landed in East Anglia in 865 the Anglo-saxon kingdoms of Britain knew no peace. By 875 only ten years later, East Anglia, Northumbria, Mercia and even Wessex all had new rulers. All but one of these kings had been set up at the instigation of the Danish invaders. 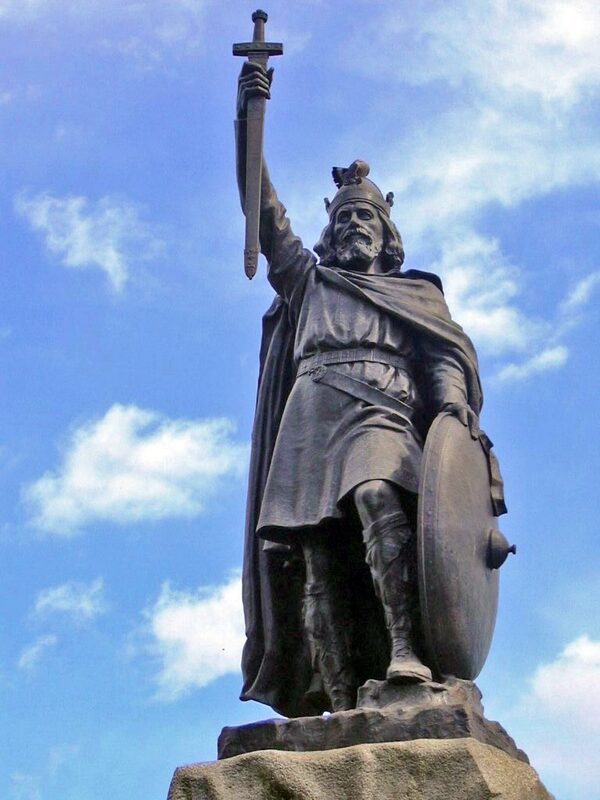 The exception of course being Alfred the Great, one of the most famous kings in English history. After killing St Edmund in 869, the Danes moved from york to attack the lands of Wessex which at the time were ruled by King Aethelred. Halfdan and his brother Ubba made their headquarters at Reading late in December of 870, and their men set about fortifying the royal vill with a trench. It was not long for their presence to be noticed by the Aeldorman of Berkshire, Aethelwulf. Three days after the danes arrived at Reading two earls and their fighting men rode out on a raiding and scouting expedition. On the 31st of December Aeldorman Aethelwulf confronted them in the field known to the locals as Anglefield and after a fierce and bloody fight the Anglo-saxons killed the Danish earl Sidroc, killed the greater part of his force, and sent the remnants of the danes and their surviving earl back to the main army at Reading. It was the first battle in what would be one of the bloodiest years in the history of Wessex, and the first victory had gone to the West Saxons. Four days after the skirmish between the Danish raiding party and Aeldorman Aethelwulf’s fyrd, Aethelred the King of Wessex arrived with his army at the Danish encampment at Reading. With him was Aeldorman Aethelwulf, and the king’s youngest brother Alfred, then merely a prince of Wessex. The contingent set about killing the Danes which had been caught outside of their own defences. Those who had been concealed safely within then burst through the gates in full force and gave fight to the Anglo-saxons. As so often described the battle was long and fierce, but it was the Danes who claimed the victory. King Aethelred and his brother were forced to retreat, sadly leaving the heroic Aeldorman Aethelwulf dead on the field of battle. No time was lost between these two initial attacks and the third. Only four more days passed before the two sides were again engaging in battle. At Ashdown they each split into two separate companies. The Danes split themselves with Halfdan and Bagseg (leader of the reinforcements known as The Great Summer Army) in one group, and their earls in another, claiming the most advantageous spot on a hill overlooking the West Saxon forces. The Saxons likewise below them were split between their king and their prince. The tale told of the initial battle sees King Aethelred in his tent before the engagement, praying with his priest for God to grant them victory. Meanwhile, the Danes are lined up and ready to go and in the absence of his brother, Prince Alfred is faced with a difficult decision. He waits with the army lined up and waiting opposite the Danes, but it soon becomes apparent that the King will not leave his tent until the mass is finished. Eventually, the young prince advances against the enemy, a lone tree marking the middle of the fight. By the end of the fray, after King Aethelred had joined his men, Bagseg the viking leader had been killed along with several of his earls (Sidroc the older, Sidroc the younger, Osbeorn, Freana, and Harold are named) and numerous others. The Danes had lost this third bought and apparently took flight back to Reading all through the night and through the next day as well. A fortnight’s respite was all that either side received before they were again at each others throats. This next scrap happened at Basing and all we know is that the Danes gained the victory. By now both sides had fought four battles in less than four weeks with both sides suffering from heavy casualties. It was over two months before either side met again, this time at Marton. The battle of Marton in March saw the royal brothers of Wessex once more splitting their forces into two to come up against their viking foes. The West Saxons prevailed at first in driving the enemy back for most of the day, however we are told that the Danes eventually reached the upper hand and won the battle. Hamund, the bishop of Sherbourne, is said to have fallen in this battle fighting alongside his king and countrymen. Sadly, almost a month to the day since this last battle, King Aethelred of Wessex dies just after Easter. He had reigned for only five years, inheriting the kingdom only after his three elder brothers (Aethelstan king of Kent, Essex, Surrey and Sussex d. After 851; Aethelbald of Wessex d.860; Aethelwulf d.865), had died, and had done little else but try to protect his lands and his people from the invaders. He left behind two sons, Aethelwold and Aethelhelm, who were too young at the time to effectively rule. Faced with an uncertain future thanks to the Danes still dominating the battles, the leading men of the kingdom chose Prince Alfred as successor. The battle of Wilton was the last between the two sides for 871. In less than six months the kings of Wessex had fought nine battles and we are told numerous other skirmishes and expeditions. Both sides had suffered heavily, loosing many of their military leaders and earls, and so a truce was agreed upon to the benefit and no doubt relief of both. The Danes were finally bought off on the condition that they immediately left Wessex and didn’t return. The Danes agreed, taking their newly acquired booty back east to the Thames River to make their winter encampment in the Mercian city of London. Wessex could breathe a sigh of relief. Unlike the East Anglians, Mercians and Northumbrians, they had escaped defeat. For now. If you enjoyed this post or any others on my blog, then please vote for A H Gray in the Best Australian Blog Awards.